​1971 proved to be an interesting year in England, with the likes of T. Rex, George Harrison and a Celtic-loving Rob Stewart topping the singles chart, while the year also marked when the United Kingdom and Ireland decimalised their currencies (exciting times I know). In footballing terms however, the year was also the last time that six English sides reached the quarter-finals of European club competitions - a feat not equalled in the 48 years that followed, until the 2018/19 campaign. The efforts of ​Tottenham, ​Manchester United, ​Manchester City and ​Liverpool in the Champions League, and ​Chelsea and ​Arsenal in the Europa League, means that for the first time since 1971, England has six representatives in the quarter-finals of major European competition. Ahead of their eagerly-anticipated ties, we take a look at how the previous crop of teams fared 48 years ago. England's sole representative during the 1970/71 edition of European football's biggest club competition was in fact Everton, after winning the First Division under Harry Catterick in 1969/70 - the club's seventh league title at the time. The reward for the Toffees following their league triumph was a first round draw against Icelandic side Keflavik, which they came through with relative ease, with Alan Ball's hat-trick at Goodison Park helping Everton to a 6-2 win in the first-leg, before securing a 3-0 victory in the second-leg to advance with a 9-2 aggregate win. German champions Borussia Monchengladbach - who were in the midst of their most successful period in their history - awaited Everton in the second round, which was hotly contested over both legs, which both finished 1-1. A penalty shootout decided who would advance to the quarter-finals, and despite an unsuccessful effort from Joe Royle, Ball, John Morrissey, Howard Kendall and Alexander 'Sandy' Brown converted their penalties to record a 4-3 shootout win. The quarter-finals however proved to be Everton's stumbling block, as the Toffees were knocked out by that season's runners-up Panathinaikos. Antonis Antoniadis - that season's top scorer in the competition with ten goals - gave the Greek side the lead in the first-leg at Goodison Park, before Andrew Johnson levelled for the hosts. However, a goalless draw in Greece meant Catterick's side saw their European adventure come to an end due to the away goals rule. In what was its final season being called the Inter-Cities Fairs Cup, before being replaced by the UEFA Cup the following campaign, which later became the Europa League we know today, last season's winners Arsenal, Liverpool and Leeds United were flying the flag for England. Despite being the reigning champions, the Gunners would be the first English team to be knocked out of the competition, at the quarter-final stage. After overcoming SS Lazio, Austrian side SK Sturm Graz and Belgian outfit K.S.K. Beveren, Arsenal lost their crown to German side FC Koln in the quarter-finals on away goals, after the tie finishing 2-2 on aggregate. Liverpool would go one stage further than their north London counterparts, reaching the semi-finals having navigated their way past Ferencvarosi TC of Hungary in the first round, Romanian side Dinamo Bucuresti in the second round, Hibernian in​ round three and German giants Bayern Munich in the quarter-finals. On this day in 1971! The Reds, managed by legendary figure Bill Shankley at the time, would bow out at the semi-final stage however to ​Leeds, as Billy Bremner's solitary goal across the two legs decided the tie. Going further than any other English club in that season's competition, Don Revie's side faced Juventus in that year's final, with the Yorkshire club gaining a slender advantage in the first-leg that was replayed due to a goalless draw, as goals from Paul Madeley and Mick Bates helped secure a 2-2 draw against Juve, and the advantage on away goals ahead of the second leg at Elland Road. Despite being pegged back with a goal from Juventus' Pietro Anastasi, following Allan Clarke's opener for the hosts, Leeds held on for the famous win via the aid of away goals, after the final finished 3-3 on aggregate, becoming the final club to win the Inter-Cities Fairs Cup, as it was known then, in the process. The final two English representatives that season in European competition were Manchester City and Chelsea, with the pair competing in the Cup Winners' Cup. City were in the competition as defending champions, while the Blues qualified for the competition following their FA Cup triumph in 1970, and both teams found success in that year's competition as they reached the semi-final stage, before being drawn against one another. On that occasion it would be Chelsea that had the edge, knocking the defending champions out in the process with a 2-0 aggregate win, winning both legs by a solitary goal. Their reward for knocking out the holders was a final against Real Madrid, which had to be replayed following a 1-1 draw in the initial final. Chelsea however overcame the Spanish giants in the replay, as goals from John Dempsey and Peter Osgood - who scored in the first meeting - helped the Blues to a 2-1 victory over Los Blancos in Greece. 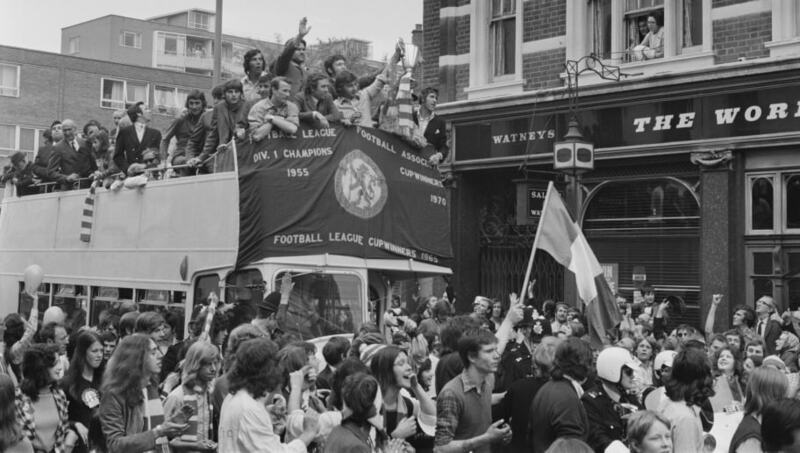 ​Now for the English side's in 2019 who hope to follow in the footsteps of 1971's Leeds United and Chelsea and finish the season with a European trophy. Regarding the Champions League, there's a guarantee that at least one English club will reach the semi-final after Tottenham were drawn to play Manchester City in the quarter-finals, where one will face either Ajax or Juventus in the semis. Liverpool have been handed a favourable draw to reach the semi-finals, on paper at least, with them set to play FC Porto, while Manchester United face Barcelona, with there being the chance of England's two most successful clubs facing off in the semi-finals should they win their quarter-final clashes. In terms of the Europa League, Arsenal have a tough task ahead of themselves after being drawn against Napoli in the quarter-finals, while Chelsea are set to face Slavia Prague , who knocked out serial Europa League winners in the last 16 and shouldn't be overlooked, although the Blues' record in the competition stands them in good stead, having won it in their only previous appearance in 2013. While there's plenty of football to be played between now and both finals, the stroll down memory lane highlights the magnitude of the feat achieved by the ​Premier League's top six this season. The last time the Europa League (or UEFA Cup) and Champions League (or European Cup) were both won by an English side was back in 1984 (Tottenham and Liverpool).